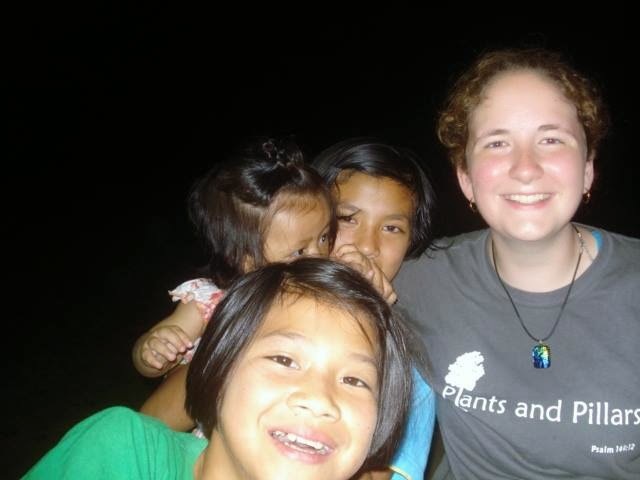 And it made me miss the kids who live at the House of Faith orphanage in Chiang Dao quite fiercely. Depreena and I only spent a few nights there, and communication was limited, due to my Thai vocabulary consisting of sawadee-ka (hello) and korpkun-ka (thanks), but there was a lot of fun and laughter and love. I remember a conversation with Mookda as we walked back from our swim time in the nearby dam about how we were sisters because we're both Christians. As I was thinking about them, and how many places I want to be at all times (you know, back in China, back in Thailand, checking out India, etc) I started thinking about other kids who have been in my life. But there are a lot of other kids (some of whom are, ahem, not such kids any more. SOME OF WHOM ARE NOW TALLER THAN I AM!) who I've had the awesome opportunity to get to know and be a part of their lives. At church camp. In Aliquippa. As a camp counselor. In youth group. At college. And, yeah, in China and Thailand too. Each of them have been in different parts of my life. Sometimes we got to interact year after year, sometimes only for a couple of days. And they have all been good gifts to me. I pray for them, often randomly, as they come to mind. I stalk them on facebook or google or through friends to try to find out what they're up to. I hope to cross paths with them again sometime, I hope to hear that they're doing well and flourishing. Because all of these kids, adopted little sibs of mine -- yeah, I still feel a little responsible for them. I have a feeling you are far wiser than you think. *cries* I love this book so very much. So much that it hurts to read it. "Love is a strange fact-it hopes all things, believes all things, endures all things. it makes no sense at all."